Recorded as Rimer, Rimmer, Rymer, Rymmer, and possibly others, this was an occupational name for a poet or minstrel. 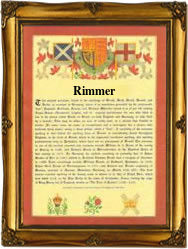 It derives from the early French word "rimour or rymour" meaning one who wrote rymes. The word was probably introduced into the British Isles after the famous Norman Conquest of England in 1066, and the original "rymers" were almost certainly employed in royal or noble housholds to teach song and dance. Later they had a more public roll, being either members of the famour travelling theatres of the Medieval times, or as newsgatherers passing from village ot village. The first known recording as a surname is 13th Century, (see below), and another example from early history is that of Richard le Rimour in the Coucher Book of Whalley Abbey, Lancashire, in 1377. Parish records of the city of London include Alexander Rymmer who married Margaret Galleth on July 26th 1585 at St. Dunstan's in the East, Stepney, and Elizabeth Rimer, who was christened on December 2nd 1639 at the same church. Amongst the notable namebearers in the Dictionary of National Biography is Alfred Rimmer (1829 - 1893), artist and author. He published a number of illustrated works on English topography. The first recorded spelling of the family name is shown to be that of Warin Rymer. This was dated 1229, in the registers known as the "Calendar of the Patent Rolls for the county of Yorkshire", during the reign of King Henry 111rd of England, 1216 - 1272. Surnames became necessary when governments introduced personal taxation. In England this was sometimes known as the Poll Tax. Throughout the centuries, surnames in every country have continued to "develop" often leading to astonishing variants of the original spelling.